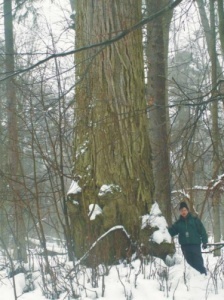 Small-leaved lime(Tilia cordata) in the Bialowieza Forest reaches a little smaller size than pedunculate oak. Limes of monumental sizes survived only in the area of Bialowieza National Park. The reasons for that were: getting limes as sculpting materials and treating it by the forestry services as a less valuable species for timber industry. . Namely the species which has to be rooted out of the treestand. In fact in the developed part of the forest occurence of monumental limes is limited to a few forms and these are mainly specimen with the trunk perimeter not exceeding 450cm. The exception is a lime growing in the north-western part of the forest, which perimeter is about 550cm at present. The situation is completely different in the Bialowieza National Park. Here limes of monumental sizes are numerous, the thickest reach almost 6 meters in trunk perimeter at the height of 130cm, and trunk pillar(of some trees) to the first branch reach 18-19 meters. As for habit, the most impressive lime of the Bialowieza National Park grows near 'The Detour'. 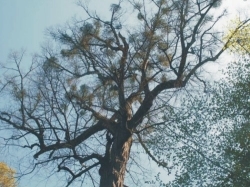 It is a tree with a very spectacular pillar's trunk(height-24m) slightly bending east. It has a wide-spreading crown and reached sizes are very impressive ( height-32m, perimeter in the middle-572cm)(see photo below). Unfortunately another huge lime(height-29m, perimeter-572cm), well known to tourists visiting the National Park, has withered recently. It used to grow by the road joining the main gate of the park with the natural reserve 'Mogila'. Several years ago the tree lost one of the main limbs of its crown, what- as we may guess- sped up the withering of the tree. 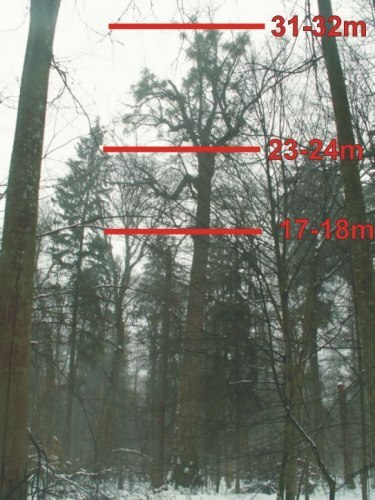 According to literature the maximum size of limes growing in the Bialowieza Forest is: height-42-43 meters, trunk perimeter-580-600cm, with maximum age-200-250 years. Measurements taken by me confirm the maximum tree diameter of the forest limes but the height given by sources are a bit overstated. My measurements show rather 35-36 meters of the maximum height.